It's June 1st, also known as National Donut Day and the beginning of LGBTQ Pride Month. As a quick history primer: Pride Month is celebrated in June to honor the Stonewall Riots, an uprising led by Black and Latinx queer and trans people in response to police violence in Manhattan, New York in June of 1969. This riot is known as the beginning of the modern-day LGBTQ+ rights movement that continues today. After Stonewall, the last Sunday in June was known as “Gay Pride Day” around the United States. In 1994 a group of organizers selected October as Gay Pride Month. Over time, October became LGBTQ History month and the designation of Pride Month shifted back to June. With this shift, the scope of the celebration expanded from just gay pride to the entire LGBTQ+ spectrum. 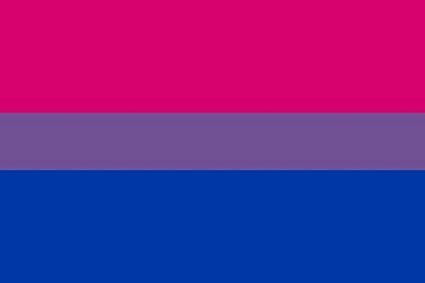 This is the Bisexual Pride Flag. It becomes relevant soon. My relationship to Pride Month is constantly evolving. I don't think I genuinely knew about Pride Month until I was in college, so around 2013/2014. I'd questioned my sexuality since I was a kid, because I knew I was attracted to boys and girls during elementary and middle school. By high school, I'd convinced myself that it was a phase, even though my first crush and the first person I ever kissed was one of my childhood best (girl) friends. I somehow convinced myself I was straight for the better part of 4 years, because I couldn't agree with the concept of a more expansive sexuality, I thought you had to pick a side, and I knew I wasn't a lesbian. Couple that with being part of a super-religious Black family, and I honestly decided that trying to figure out who I really was wasn't worth the headache. I've still never had an open conversation with my family about my sexuality and don't really plan to unless it's necessary, as in I start dating someone who isn't a man. I feel like I'm fighting battles every day for my existence because of my other, more visible identities, I'm not sure if I could handle more. Once I got to college I met new people, joined organizations, and went to lectures and events geared to LGBTQ identity because I considered myself an ally. These experiences gave me the language, history, and validation needed to start processing my feelings toward my sexuality again (spoiler alert: I'm bisexual). The thing about coming to an epiphany about your sexuality while you're 2 years into a long-term relationship with a cisgender man is that it's hard for people to believe you, for lack of a better word. It's why I consider myself eternally closeted. I've been told so many times to my face that I'm just a straight girl who wants attention. And i'd be lying if I said that those statements didn't get to me. If I'm in a heterosexual monogamous long-term relationship, does the fact that I'm bisexual even matter? It's not like anyone can tell by looking at me or my partner. I'm "straight-passing" for lack of better words, and while it gives me a level of privilege many LGBTQ don't have to be free from harassment about my relationship, it also means that my identity as a bisexual woman isn't seen as legitimate and I feel constantly on the fringes of the community. Which comes with its own pros and cons, because the mainstream LGBTQ+ community definitely struggles when it comes to supporting most of the letters in the acronym that aren't "G". I wish I could say that I've reached closure regarding my own identity and the general idea that all sexualities are valid regardless of how they're presented, that you can't judge a book by its cover, etc. but these feelings of confidence in my own identity are few and far between for me. When it comes to Pride Month specifically, I normally opt to take a back seat to the more marginalized whose voices should be heard more often. And I still plan to do that this year, but maybe I'll also choose to be more open about my identity and experiences in the hopes that it makes others feel seen and heard as well.